Since its foundation in 1970, NASSAU Door A/S has earned a reputation for being a rapidly growing company, taking it to its current position as one of Europe’s leading manufacturers of sectional overhead doors for industry and private use. 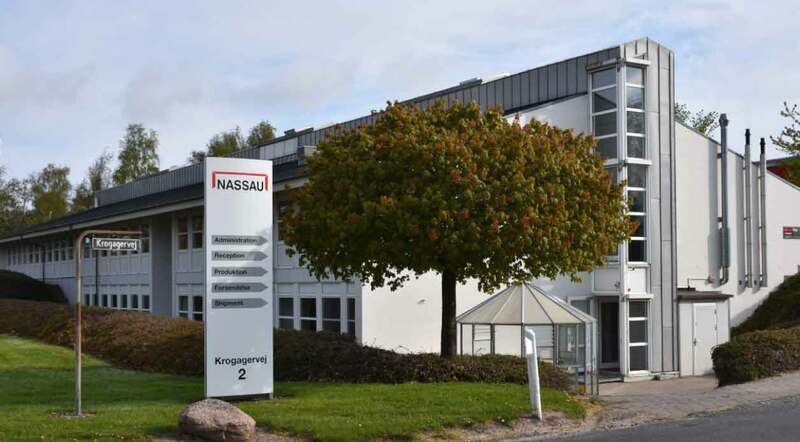 NASSAU’s success also extends from its headquarters in Denmark onto the international scene, with subsidiaries in Norway, Sweden, Holland and Belgium, plus an extensive network of dealers in other countries within Europe and beyond. By focusing on new product development and opening up new markets, NASSAU continues to build and extend its market position. The fruits of this policy can be seen in its steady increase of market share in Europe over the last few years. Functional door design goes hand-in-hand with a wide range of architectural styles, and NASSAU’s goal is to be the architect’s preferred choice when it comes to challenging new constructions and refurbishment of existing buildings. Competent consultancy provides the customer support throughout the value chain – from initial contact to installation, servicing and maintenance advice. NASSAU has a comprehensive team of consultants and specially trained fitters backed by a well-developed service organisation, all dedicated to ensuring a high level of support for product functionality, maintenance and durability. NASSAU develops not only doors, but good customer relations too by working consistently to ensure that the customer’s impression of NASSAU and its products is a positive one – right from initial consultation to delivery, installation and maintenance. As a manufacturer of industrial sectional overhead doors, NASSAU operates primarily on the Business-to-Business market. Usually, we deal directly with the end-user, or via building contractors or consultants (engineers/architects). What is expected of our doors depends on the industry sector they are to be used in. Consequently, we have developed a range of highly flexible doors, which enables us to supply tailor-made solutions to such a wide range of sectors as: agriculture, logistics, food and beverages, fire stations, car dealers, industrial enterprises and workshops, plus private customers requiring a high quality door in attractive design. Our product range is marketed under the NASSAU brand name, and covers a spectrum of automatic and manually-operated doors – all with one thing in common – NASSAU quality. And of course, each one will be designed to meet the customer’s specific requirements for functionality, climatic conditions, size and design. Requirements that cannot be met from our standard range are referred to NASSAU’s Technical Department, which will provide customised solutions. The breadth of our product range is backed by a truly flexible service concept. We recommend all our customers to take out a service agreement with the local NASSAU-dealer to cover all maintenance needs for doors and accessories. Cover includes safety checks and preventive maintenance. A service agreement is an additional guarantee of a long-lasting, fully functional sectional overhead door. Some European countries have made it a requirement by law that overhead doors must have at least one annual service check – something that is automatically covered by a service agreement. NASSAU’s doors and panels are all produced at our factory located in Denmark. Panel production and door assembly are performed at one of Europe’s most modern production plants in Ringe. NASSAU’s modern production facilities provide a high degree of flexibility, allowing NASSAU to offer individual solutions, but always with the same high standard of quality. They also mean that design, delivery times and quality for all our products are always up to and exceed market expectations.